A few weeks ago I had the idea for a thick and quick to make cozy winter hat. Something that was easy and fairly mindless and you could just create a stack for by the front door. “Oh! It got so cold outside! Take a hat!” Or that could be made for the homeless with a stack in your car for giving away. Because Hygge is cozy I decided to name it the Hygge Hat. 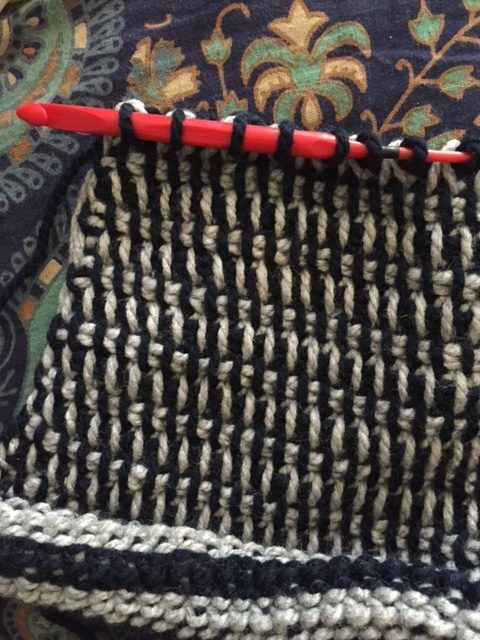 I got right to work on a quick Tunisian Crochet design. My first one was this gray and teal number. I admit it wasn’t quite the cozy factor I was going for, BUT my son saw it and begged for one, and then my husband wanted one too, so maybe it is perfect for a stack by the door. It’s the perfect project if you’ve been doing the CAL! You’ve learned the stitch AND it’s a break week from the blanket pattern. My son asked for one in “Barcelona Colors” for the soccer team and picked this red and navy blue. Both of these were made by doing the Tunisian Simple Stitch in the round. 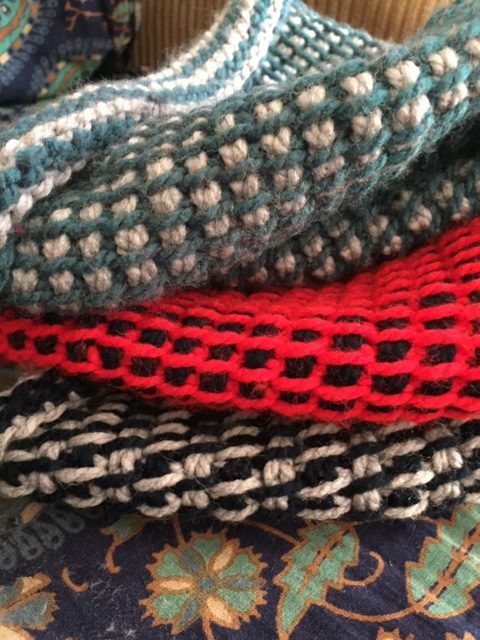 If you’ve never done Tunisian Crochet, don’t worry! Here’s a stitch tutorial video! Working in the round is done differently than working flat though and requires a special hook, SO I wanted to see if this hat would look great if done flat and then seamed. It DOES! 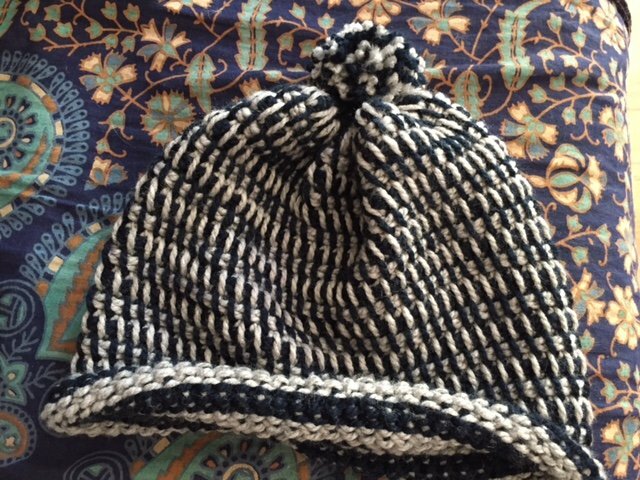 I made this hat with my husbands color choices but worked flat. The colors do come out more balanced, where worked in the round tends to feature one color more. And so the pattern will tell you how to do both, worked flat then seamed and worked in the round. Pom Pom maker- or your favorite method of making pom poms. You can use any weight yarn, BUT you’ll need to figure out the initial chain and hook size. Just chain a row that fits comfortably and slightly loose on the head. For me with a worsted weight this was about 100. Remember Tunisian Crochet usually uses a larger hook, so for worsted weight yarn you’ll probably want an I or J hook. 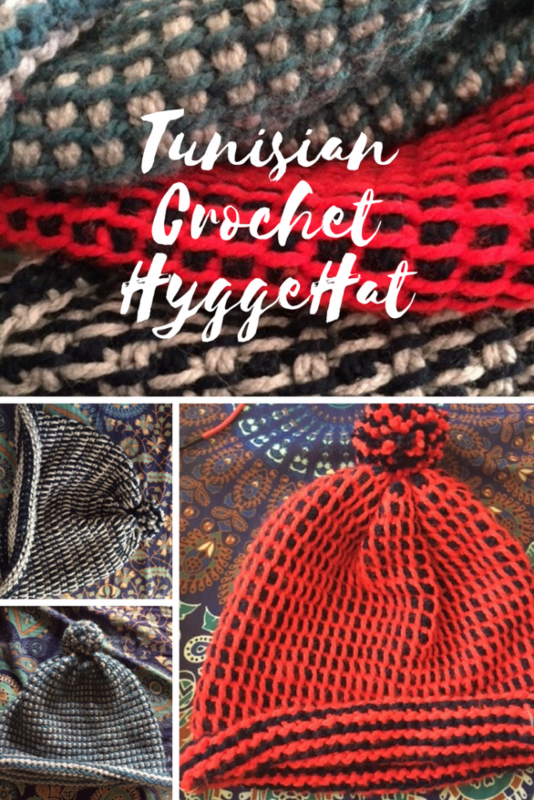 You can use other Tunisian Crochet stitches! I haven’t experimented with this yet, but it will work. You may need to change your initial chain row to accommodate different stitches. To Work in the Round: Join chain into a round and begin working the Simple Stitch. To Work Flat and Seam: Begin the first pass of row one of the simple stitch with the chain color. When you get to the end of the first pass drop the chain color and join the contrasting color. Work the second pass of the stitch with the contrast color. Work pass one of the next row with the contrastign color. When you get to the end of the first pass you will pick up the next color and complete the next two passes in that color. Your unused color can just dangle on the left hand side and be picked up again when you get there again. After every first pass (picking up loops) you will change colors. Sounds hard, but it’s super easy. Work in pattern stitch for 9 1/2 inches total. The bottom of the hat will curl, flatten it to measure the total length. For the first pass of the next row decrease all stitches. To do this – Instead of going under one bar and drawing up a loop you will go under TWO bars and draw a loop through both at once. Making every two stitches into just one stitch. This is how the decrease row looks when done flat. Leaving all these stitches on your hook do not complete pass two. Instead cut the thread with 12 inches or more left (for seaming when worked flat you may want to leave closer to 20″) and then pull it through all the loops on your hooks, gathering them all up. Secure the gather to keep it tight. If you have worked flat you can now sew the seam down the side of the hat. Use any remaining yarn to make a pompom (mine are all 1 1/2″) and sew that to the top. Repeat until you have a stack of hats. The gathered top does look less bulky when you are wearing it, but no one in my family will me let me photograph them to prove it! This hat is on Ravelry. So You can save it for later, or easily show off your project! Feel free to friend me while you’re over there! Contact me if you have ANY problems or questions. I’d LOVE to see your finished hats! I can’t wait to try this! Can you show us how you joined and alternated the different colors and seamed it together? Your tutorials are fantastic! The color changes happen naturally by just doing the stitch, but I can show how to change colors at the end of the row, and I’ve been meaning to do a video of how I usually do my seams. It’s all way easier than it sounds!